More than three years after its $2.3 billion sale by Anheuser-Busch InBev (BUD) to private-equity giant Blackstone (BX), SeaWorld (SEAS) is trading on the NYSE after raising a reported $702 million in one of the largest IPOs of the year. In its first minutes of trade, the stock is up 15% from its offer price of $27, which was at the top of a range starting at $24. SeaWorld sold 10 million shares and Blackstone an additional 16 million, more than the 10 million originally slated. The underwriters, including Goldman Sachs and JP Morgan, have a 30-day option to sell an additional 3.9 million shares at the offer price. The deal values SeaWorld at just above $2.5 billion. This debut is part of a busy week for IPOs, which included New York-based grocery chain Fairway (FWM) on Wednesday. Other factors investors should keep in mind when deciding whether to dive into SeaWorld stock or stay onshore: The company’s high debt levels and multiples. SeaWorld, when it filed to go public, had $1.8 billion in long-term debt, some of which was incurred by a special dividend of $500 million paid last year to Blackstone (following a $100 million dividend in 2011). 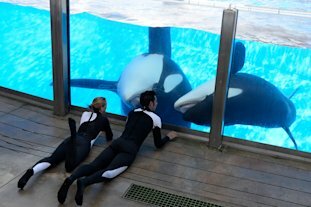 SeaWorld states in the filing that its debt could hinder its ability to raise additional capital. Also, its high price tag gives the company a hefty trailing PE of more than 27, exceeding Cedar Fair’s 22 and Six Flags’ 10.99 (per Yahoo! Finance data). Having PETA attend shareholder meetings is definitely one consequence of going public that SeaWorld will not enjoy. First of all I would like to thank you for your dedicated writing about the plight of the captive killer whales and especially the Sea World affairs. Really good writing, well researched and therefore -I think- truly fair and balanced; the way journalism in a democratic society should function. Writing this it would be impolite not to mention people like David Kirby, the team of ‘the orca project’, the persistent Naomi Rose, and Erich Hoyt who is not mentioned very often but his book The Whale Called Killer and its appendix was a true eye opener for me back in the very early nineties. At least I now understand better why and for whom the killer whales are working this hard. They are true ambassadors. Not for their own species but for another kind of predator. Talking about the whales: are they still owned by Sea World or leased? They are valuable commodities and could serve as a nice pledge to creditors. You probably can’t mortgage them; they die don’t they? But you could sell them and lease them back or something like that. Do you know if such kind of deals were struck? Tim, are you going to pursue this further? I mean are you going to delve a little bit more into the way this deal was put together and which parties are involved and who are the true winners? I know it isn’t Shamu and considering how private equity works within the current investing- and market environment it won’t be the general public either. Qui bono? I just started to delve in a little bit more into the Sea World IPO by visiting the SEC site: questions, questions, questions. I am already charmed by the term ‘indenture’ (Exhibit 10.42) and the part in the prospectus titled ‘Affiliates of Blackstone control us and their interests may conflict with ours or yours in the future’. It seems like a nice deal though, when you’re on the Blackstone side. Nicely structured. I don’t see why people want to buy these shares.